“Migrants and refugees are not only subjects of humanitarian aid, but generators of prosperity for the countries that receive them”, Sergio Vallejos, Director of Noox commented during his reflection at the High-Level Roundtable discussions held in San José, Costa Rica on November 30 and December 1, 2018. The event was organized by Asylum Access to convene societal stakeholders and create solutions for refugees. Noox is a leading real estate and arts company in Mexico and a partner in the Hospitality Route, a multisectoral effort led by Asylum Access and private companies to connect refugees with employment and education opportunities, and to contribute to local economies in Mexico. The Roundtable was the third in a series convened this year by Asylum Access with support from civil society networks, academic, and governmental allies. With an unprecedented diversity of participants, the 2-day meeting brought together more than 50 delegates representing civil society organizations, refugee collectives, private companies, international and regional governing bodies, and national and local governments. Participants discussed the outcomes of UN-led refugee response in the region, namely the first conference on the Regional Comprehensive Framework for Protection and Solutions (MIRPS), and how the region’s best practices can be scaled to reach more communities in the region and around the world. Asylum Access, the International Coalition of Voluntary Agencies (ICVA), and the UNHCR led interactive group work and debate that generated a rich discussion of the challenges and opportunities facing efforts to allow refugees the protection, services, and opportunities they need. A main theme was repeated throughout the discussion: the whole-of-society approach. This term, made popular in the New York Declaration in September, 2016, posits that all actors that make a productive society can and should play an important role in refugee protection and integration. These actors not only include human rights and humanitarian organizations, governments, and international organizations, but also the development sector, manufacturers, service providers, the tech industry, cultural figures, and most importantly refugees themselves. The whole-of-society approach gives a new meaning to “shared responsibility”; while state governments must be the primary actors in refugee governance and must share the responsibility of receiving and protecting refugees among fellow countries, the whole-of-society approach calls on all entities to contribute to welcoming refugees into their communities and facilitating their economic, social, and cultural inclusion. 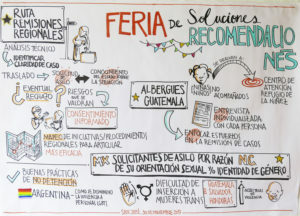 To highlight whole-of-society innovations, select delegates were invited to present their projects during a round of simultaneous talks collectively called the “Solutions and Recommendations Fair.” These included the Humanitarian Corridor, a local government-led effort to bring refugees to San Luis, Argentina; the Shelter Network organized by the Catholic church and community leaders in Guatemala; and a tri-sector partnership among ACAI, the UNHCR, the Ministry of Labor, and the Chamber of Commerce in Costa Rica to generate employment opportunities for refugees, among other initiatives in the region. During the meeting, each round of presentations was followed by a brief reflection by the presenters. The results from the High-Level Roundtable and practices from the Latin American region offer important lessons to the rest of the world about what is possible when both conventional and unconventional actors work together to provide real, sustainable solutions for refugees to find work, access opportunities, and rebuild their lives. Asylum Access would like to thank Diálogos y Estrategias, United Nations High Commissioner on Refugees (UNHCR), International Organization for Migration (IOM), Central America and Mexico Migration Alliance (CAMMINA), International Coalition of Voluntary Agencies (ICVA), Stanford University and the Costa Rican Ministry of Government and Police for their support in hosting the third High-Level Roundtable. Written by Special Projects and Communications Lead Caroline Asiala.